Last week the World Economic Forum (WEF) published its annual report on the worldwide gender-gap. Iceland was ranked first for the fifth year running, closely followed by other northern European countries. In most of the other places, and indeed in most of the other places in Europe, the situation is not looking as good. Overall, the report showed that the gap is narrowing, but only very slowly. Encouragingly, the report also showed that on a handful of indicators women are ahead of men. The indicator on which women come out most clearly on top is life expectancy. Thanks more to biology than good policies, women outlive men virtually everywhere. A more recent development is that women are pulling ahead in education. Women are more likely than men to go to university in 90 of 131 countries surveyed. Better education increasingly means better jobs: in 62 of 113 countries surveyed, women are more likely than men to have “professional or technical” jobs. If I look at my university, however, the situation is puzzling, at best. I did not find the actual numbers online, so I decided to count by myself. And for two very good methodological reasons – I did not want to waste too much time and I am lazy in maths – I decided to take into account my department only and refraining from gathering the data across all the departments. As a result, my sample is extremely small: my professors would say this is not enough to run a significant regression. However. Here are the numbers: as for the students, those admitted to the Ph.D. programme last year were 18 men and 13 women. Last year the ratio was 22 to 17. Not much of a difference, arguably. But the gap seems huge if I look at the professors: 13 are men, 2 are women. This may not be significant, but indeed it is in line with the findings of the report, and – for what matters – with the ratio of the universities where I studied before. The gap may be narrowing, but women are still on the wrong side of it. 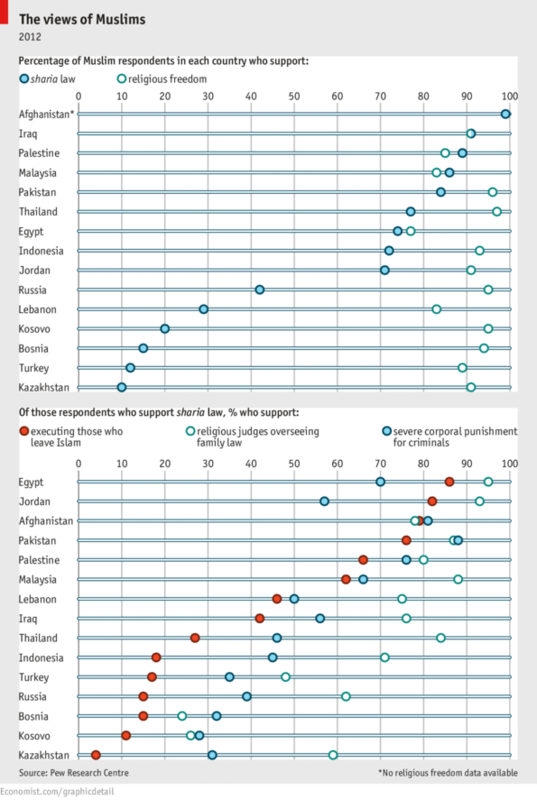 A PEW Research Centre’s report on Muslims and their attitudes to sharia law reflects man’s capacity to hold contradictory views. Almost 80% of Egyptian Muslims say they favour religious freedom and a similar number favour sharia law. Of that group, almost 90% also think people who renounce Islam should be put to death. How far can you travel with no money? As I just posted a video from UVic, it is worth mentioning another place where I studied, Trinity College Dublin. Matter of fact, Joe just shared this Time article which is about how Far Can You Travel in 36 Hours with No Money. In an event known as the Trinity College Jailbreak, nearly 70 students from the Dublin University were given a day and a half to get as far away from the Irish capital as they could without spending any money. “We originally thought people would travel to the U.K. and around Ireland, we never imagined they would make it out of Europe,” Sorcha McCauley, one of the organizers, told TIME over the phone. According to McCauley, two competitors made it as far as St. Peter’s square in Vatican City, where they dressed up as priests and handed in their résumés for a certain job opening. But others arrived even more far away: apparently, a few of them did arrive in the hometown of that other person who got the job – just tonight. To find out, read the rest of the article here. I am very sorry to hear that New York Times Co. (NYT) is formally exploring a sale of the Boston Globe, its only remaining business outside the core New York Times media brand. Boston Globe is a quality newspaper, and the main provider of stunning pictures that I regularly admire on the Big Picture section of the website. I hope that won’t change with the future ownership. Support groups for the unemployed are a new form of solidarity, spontaneously created by people who were out of work to combat loneliness and depression. They fill the void created by the virtual disappearance of trade unions and the absence of collective movements. This is a great lessons for Italian and European trade unions, which – I think – are stuck in the political battles of the 1970s and do not realize they are completely loosing touch. The Wall Street Journal recently reported of a dossier delivered to the clients of Goldman Sachs from the same office that anticipated the economic boom of the BRICs four years ago. The dossier shows that the US will remain the most attractive economy in the 21st century. This is due to the fact that the US maintains important relative advantages on all the other world economies on a variety of different levels: immigration, human capital, institutional trust. Even Rupert Murdoch’s Wall Street Journal recognizes the merits of President Obama in building trust and confidence among citizens. NY Mayor Michael Bloomberg, who I am assuming will run for the US Presidential elections of 2016, is launching a new operation transparency aimed at monitoring the expenditure of the municipal administration. It is done throug a new website called Checkbox NYC 2.0. The website makes it easy to control the expense of the municipality, item by item, almost in real time. It manages to strike a reasonable balance on personal privacy, providing useful information about the cost of public employees without attaching the numbers to specific names. It also gives an idea of how much is spent for the different items (e.g. education, police…). Although the website is still imperfect, it significantly increases the power of civil society. This is one excerpt from the correspondence with my friend Tommaso, who is now studying at the London School of Economics in London. Every morning, when you enter in the Old Building you can pick up a newspaper for free. Usually there are two: the Herald Tribune for the progressives and the Wall Street Journal for the conservatives. If you come at lunch-time there are only copies of the Wall Street Journal left, and at 6 in the afternoon they are still there. The IOS update for iPhones provided by Apple a few days ago is driving me mad. Bugs include problems with texts, lost contacts, issues with connecting to the internet and a new maps app which misplaces whole towns, cities and buildings. In other words, a total mess. Such drawbacks never happened before with Apple. Now, I do not want to be one of those taking Steve Job’s as an icon, but his philosophy was that things have to be perfect before they go out on the market – whatever it takes. I guess this is a huge washout for Apple. Wait for the consequences. Che le cose nella scuola italiana vadano a rotoli, si sa. Due citazioni per una riflessione . Il buongiorno si vede dal mattino ed ecco che il primo quesito del mio test era (non scherzo) “Chi ha scritto ‘Oceano mare’? “. Ma non è questo il punto della questione. Complessivamente, le prime 50 domande (le altre 10 riguardavano la comprensione di due testi scritti) trasmettono una concezione aberrante della formazione che ci si aspetta dai futuri-aspiranti docenti e, di conseguenza, una analoga concezione dell’insegnamento. In una parola: nozionismo, puro e semplice. Per rispondere alle domande riguardanti la letteratura non serviva aver letto nessuna opera, bastava sapere a memoria una brava lista di Autori, Titoli, Anni di edizioni, Dedicatari. Punto. Lo stesso vale per le domande di storia: solo date, non era richiesta il possesso di nessun ‘contenuto vero’. Certo, le date sono importanti, certo le nozioni bisogna averle, ma non basta: tanto varrebbe registrare una lezione-tipo e trasmetterla in tutte le classi d’Italia, se l’insegnamento fosse limitato a questo. Già.